The tribal tune trio returns with a follow up to their 2009, Contraption I, and last year’s breakout full length album, Elektrafone. To say Beats Antique are in a league of their own would be putting it lightly. Since their inception just 5 years ago, they have paved the way for an avalanche of circus freaks, afro-beats, and world music treats in a similar style. 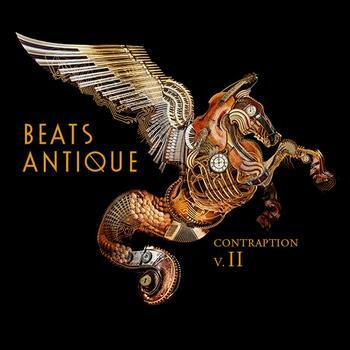 Reinventing themselves once again, Contraption II is a forward thinking four track EP not to be taken lightly. Beats’ typical eastern instrumentals take on a subtle, glitchy sound on “The Allure”, which recruits strings and basslines in succession to articulate its desert descent. Their previously released single, “Skeleton Key”, begins in a similar, world jazz fashion, by epitomizing all of the usual imagery: The middle east, a thriving desert city, veiled belly dancers, a strange bazaar with hidden delights, tribes from far off lands, traveler’s smoking hookah. The advent of “Crush” almost incites worry, as the style is nearly indiscernible thus far. Luckily Bass Menazeri step in on this track to give it some much needed brass boost. The addition of funky horns to the Balkan chants, along with Sidecar Tommy’s incomparable percussions, creates a mid-tempo dance track that puts Calvin Harris in his place. What would a Beats Antique album be without the beloved LYNX? “Crooked Muse” is the perfect complement to Contraptions II. With sultry burlesque feel to it and feisty bridge, this is definitely a song for lovers. Like much of the Beats’ catalogue, Contraption II is much more of a journey than a destination. The imagery is vivid and will not disappoint long time fans. For those just learning about this multi-instrumental movement, it’s never too late to jump on board.